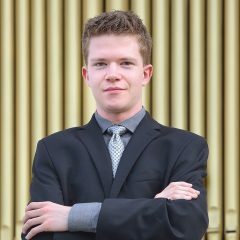 Thomas Mellan (BM ’17), who is currently double majoring in Organ Studies and Composition at USC Thornton, recently undertook a Summer concert tour of France and the Ukraine, performing in spectacular churches and festival venues, including Saint-Antoine-l’Abbaye and Saint-Martin d’Esquermes. In Lviv, Ukraine, Mellan presented a series of three concerts at the Lviv Organ Hall, including the Ukrainian premiere of Oliver Messiaen’s major serial work, Livre d’Orgue, as well as pieces by Bach, Franck, Liszt, Mozart, Reger, and Webern. In the concert video below, Mellan performs an excerpt of Clérambault’s Livre d’Orgue, the Suite du deuxième ton, followed by Messiaen’s Livre d’Orgue.